The last Sunday (9th July) I had my art fair debut as an exhibitor at the House of Illustration’s Illustrators Summer Fair! Since I don’t even have an online shop at the moment, i had been too reluctant (and a bit scared) to give a go at selling my stuff at any fair/market. I was like ‘What if I can’t make enough stuff to exhibit?’, ‘Are my illustrations good enough?’, ‘What if no one buys my stuff?’ etc etc… However, one day in May one of my talented artist friends, Olya Osipova, asked me and other friends (equally talented Sangeeta Bhagawati and Rachel Bone) if we were interested in sharing a table at the HoI fair. Everything seems achievable and exciting if you do with your friends, right? So I said yes. First and foremost, I should talk about the host. Located in Kings Cross, London, House of Illustration is the UK’s only public gallery dedicated solely to illustration. They host the illustrators fair twice a year (in summer and in winter). 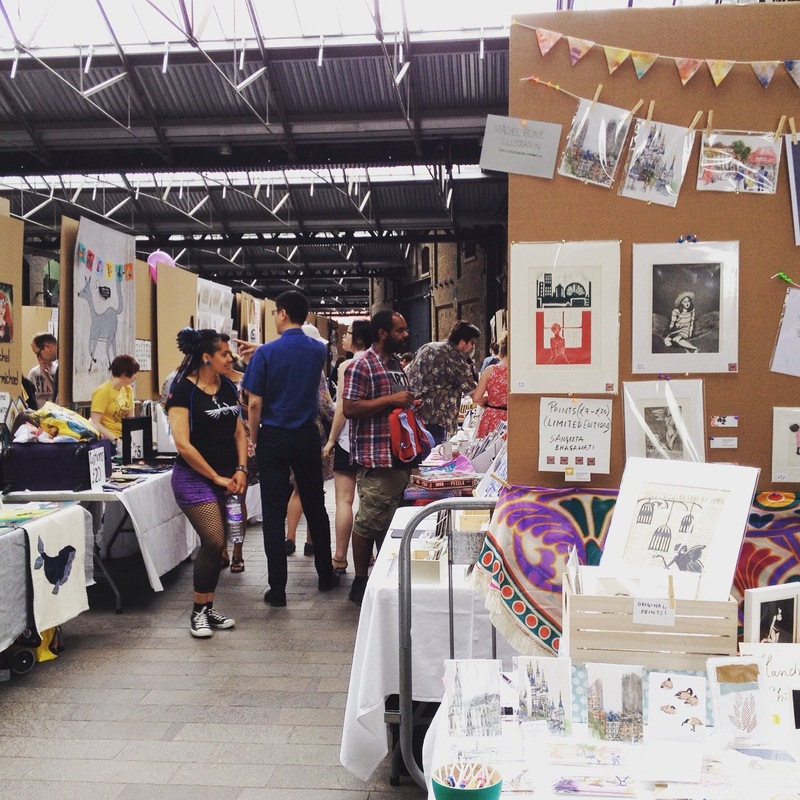 The fair is an one-day pop-up market, hosting 150 hand-picked stalls selling a range of illustrated produce. Work for sale includes prints, books and ceramics across styles from children’s illustration to graphic design and comics. I couldn’t sleep well the previous night due to heat and excitement and my nocturnal cat, and we had an early morning (the fair started at the midday but we were there since 9 on Sunday morning). To our surprise, we got one of those front tables! I don’t know how the allocation process worked but I guess we were simply lucky. I freshly made some greeting cards and illustrated recipe cards only for this fair (printed by my favourite printer Moo). One of the benefits of sharing a table with friends is that you don’t have to have tons of stuff to fill the table. I was pretty happy with how our table looked with our products. It looked colourful as four of us have totally different artistic styles. My strength in cute, children’s’ illustrations. Sangeeta does crafted printmaking with exotic flavours. Olya does stunning watercolour illustrations with colourful and fluid strokes. Rachel is a skilled urban sketcher. To be honest with you, I didn’t make many sales. Probably because we were pretty much unknown artists (there were popular/published illustrators like Helen Hancocks and Steven Lenton). But Olya’s friend who was also exhibiting that day didn’t sell a thing even though she’s a professional and successful books illustrator. Maybe because our table had a good visibility but not a good traffic. Maybe because there weren’t enough marketing by both the host and the exhibitors. In any case, art fairs must be a tough business! Regardless my sad sale’s result, I personally thought it was a great experience. I could see people’s reactions at first hand, and I could see who was interested in my illustrations. It was mostly young mums and young children who showed the best interest. It was really assuring to know my illustrations appeal to my targeted audience. I was chuffed to see quite a few kids picked up my business cards although I knew they were not going to follow me on social media 🙂 And hearing those kind comments were very encouraging (luckily I didn’t receive any negative comments – phew!). Taking of business cards, I brought about 50 business cards with 6 different designs (also printed by Moo) to see which illustration is the most popular. Almost all the cards went and the winner was Clementine the Baker Cat (with very narrow gap). The biggest bonus for me, though, was my friends’ visits. Many friends, more than I expected, came by to say hello. Even ones I hadn’t seen for years! I was really touched. I met new people through those friends, too! So, overall, this summer fair was a great experience and I’m glad I did it. Yes, I found working with other personalities difficult as I’m used to work solo (we had a little arguments over which table cloths to use, etc), but sharing an experience with friends was fun nonetheless. One thing I regret is that I didn’t talk to other exhibitors to hear their experiences. It would have been nice and interesting. Would I do this again? I think I would. Actually I’m already considering the HoI Christmas Fair (IF I find other market buddies and IF we get selected, that is).